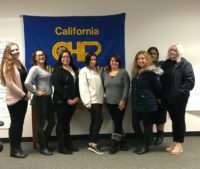 WEST SACRAMENTO – The California Statewide Law Enforcement Association (CSLEA) and the CHP Public Safety Dispatchers Association (CHP-PSDA) is welcoming nine new members who are training at the CHP Academy in West Sacramento to become CHP Public Safety Dispatchers. 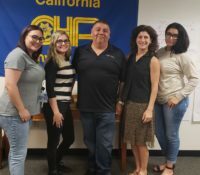 The dispatchers listened to presentations from CHP-PSDA Vice President Victor Tovar and CSLEA Member Services Representatives George Pina and Marco Castro. CSLEA and CHP-PSDA welcome to membership: Ashley Angle, Corrine Anderson, Noemi Rodriguez, Joseph Seames, Mitquiesha Pierson, Gaxiola Gabrizielle, Emily Powell, Shevonne Prewitt and Leslie DeVillires.